Discussion in 'Guitars in General' started by Tim747, Apr 18, 2016. I already have a Strat, ES-335, and LP-style model. I play blues, jazz, neo-soul, Zepp, Pink Floyd, and P&W. I play through a Deluxe Reverb, and hopefully soon, a Supro Dual-Tone. Should be capable of nice and sparkly cleans that cut well through the mix, as well as having a musical dirty tone for the whole Supro thing. paranoid70, RayBarbeeMusic and Mincer like this. mdclark58 and vashondan like this. Guild S-60 or S-300. Very unique looking, plays like an SG but 24 frets, Gibson scale, thin thin nut, super lightweight, mahogany. I threw a Fralin P92 in my S-60 and it's the SG I've always wanted. Frankee, Teleman, Ilduce and 3 others like this. I've been playing a 60's Hagstrom Impala for a while now. Unique, use-able tones (Tele on steroids), excellent vibrato, cool looks, and weighs the same as an SG. The pushbutton system works fine and it's a very high quality guitar. They're less than a grand usually. Guild M75 Aristocrat. Fully hollow without f-holes. Just a tiny bit larger than a LP, but much lighter. The Franz repro pickups are very P90 like. 27sauce, m.e., Millo 3.1 and 3 others like this. Gibson makes an SG Special T that has mini-humbuckers (which, I understand, are sonically different from regular humbuckers, single coils, and P90s). They're also the same size as P90s, so you could experiment with that if you wanted to. Retails for ~$750. Probably not what you're looking for, but the lightest guitar I owned was a Jim Adkins Telecaster. 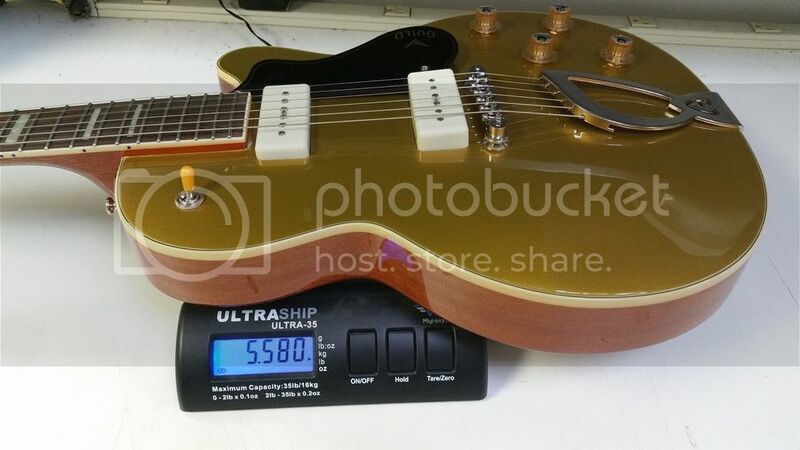 2-P90, set neck, 24.75" scale. Perhaps the unique Fender TC-90 it was based on would be a decent choice? Love the Aristocrat. Lot more classy looking than the other choices as well. Thanks for the other replies, but not too fond of the ones suggested. Anyone have opinions on how the original listed models stack up? Really wish Firebirds were lightweight, my decision would be made haha. Some more I've considered, any of those Danelectro/Silvertone models, or perhaps I grab another Fender Strat and transform it into a Coodercaster or put P90's in it. Really love how my strat plays and feels. I used to have one. Wish I hadn't sold it. Great ebony board, baseball bat neck and those bright Guild buckers sounded great through a plexi. Grrrrowlllll! Damn, must find one! Not mainstream, but Pete Malinoski (regular builder here) makes a very light instrument in just about any pup config you want. Dave Wakely and stealthtastic like this. mdclark58, vashondan and i8guitar like this. The S-60 must have a much different neck profile. My neck is super thin .80 @ 1st and .92 @ 12th and the nut is about 1 5/8". Has to be the fastest and easiest to play neck I own. The Guild Aristocrat/M-75/Bluesbird/Blues 90 is an excellent selection of guitars to choose from. From the Firebird-like mini humbuckers of the 60s, to the beefy full buckers of the 70s, to the Seymour Duncan P-90s of the...90s. 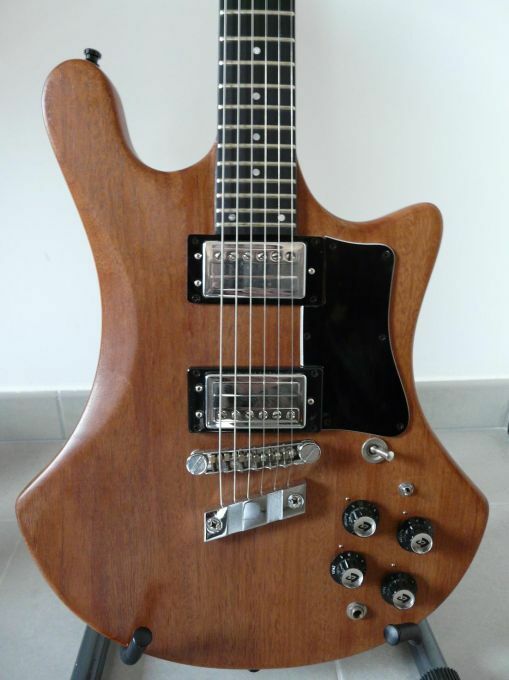 Like a hollowbody in a Les Paul shape. That said, the two I have that may be of interest to the OP are the ES-330 at 5.7 pounds, and my Artinger Blondie Jr. With a 1963 Firebird in the neck, at 6 pounds. Is it neck-heavy? Is it Gibson scale length? PRS Arch Top... It's a featherweight tone monster. Good luck finding one... they are one of the few true keepers and hence, rarely on the market. No neck dive for me. The only guitar I have that's more comfortable is a Hamer Eclipse. Made in Korea, but the quality is unmatched in anything but custom made. I have an Epi ES-339 P90 Pro that's good quality. Not just good for the price but just good. This is better.